If you just discovered that you are pregnant, congratulations! However, bringing a new human into the world is not an easy task. As you know, over the next nine months you can expect to see a lot of change in your body and life. 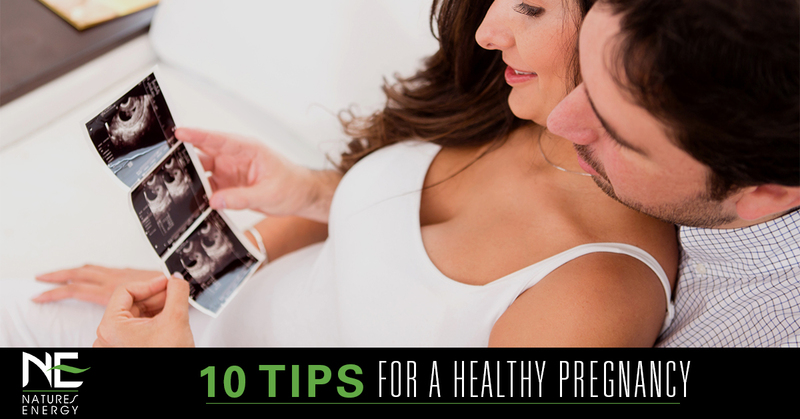 You’re likely already aware of the most basic healthy pregnancy tips—don’t smoke, don’t drink, don’t do dangerous activities, etc. In today’s article, we thought we would provide you with a few more, less-obvious tips to help you navigate all of these new feelings and ensure that you achieve optimal health up until the day you give birth. At Natures Energy, we specialize in the production of the highest quality nutraceuticals and in the most bioavailable form. We take pride in manufacturing a wide array of all natural vitamins and minerals, including liquid vitamins for toddlers and liquid prenatal vitamins. Learn more about us and shop our online vitamin store. Not only is it fine to continue exercising after becoming pregnant, but it is recommended. In fact, staying active is a must. This will help control weight, improve mood, ensure sleep, and enhance circulation. Of course, you will never want to overdo it. Be sure to always take part in safe exercises, like swimming, walking, and yoga. If your body is telling you that you’re overworking yourself, listen to it! Also, be sure to consult with your doctor and ask for his or her approval of your workout plan. Are you okay with an epidural? What delivery positions do you prefer? Do you want pain medication? Any procedures you want to avoid? If you need a cesarean, any special requests? Read the APA’s full list. Before you start reading up on pregnancy and child-rearing, know that you’ll likely never feel quite prepared. However, this does not mean you shouldn’t prepare. Be proactive and seek to educate yourself as much as possible. Attending a childbirth class, for example, can be a great way to set your expectations for delivery and ask experts any burning questions you have. Additionally, seek out good books, research your family medical history, and consult with your doctor. Although you are eating for two, you may not want to eat as much of whatever you want as possible. This will cause you to pack on too many extra pounds, making it difficult to lose weight after you give birth. With this being said, it is absolutely essential to make sure you are eating enough—not gaining enough weight can put your baby at risk. To keep yourself healthy and on track, consult with your doctor and ask for guidelines to make sure you’re gaining weight at a healthy rate. Are you always looking for a reason to buy new shoes? If your pregnant, congratulations—you’ve got a bonafide reason to go shoe shopping. As your baby bump grows, so will your feet—well, not exactly, but it will definitely feel like it. This is largely because as you put on weight, your center of gravity changes and your feet are forced to bear more weight. This added pressure can make wearing your old shoes unbearable, and on top of this, if you are experiencing ankle swelling because of all the fluids your body is retaining, the need to get new shoes will be even greater. Cave to the pressure, and get yourself some comfortable, nice-fitting shoes! Though there is some debate on the science, most doctors recommend limiting caffeine intake during pregnancy. High levels of caffeine can have adverse effects on you and your baby. However, caffeine can be a tough habit to kick. To help quit caffeine, try going to fresh fruit when you feel yourself needing a pick-me-up. The natural sugars of fruit can be perfect for providing you with the energy boost you crave. While pregnant, you may feel busy and anxious. This is normal. However, it is important to do your best to relax and indulge in the things you enjoy. Take that lunchtime manicure. Watch your favorite show. Read a book. Give into that craving for ice cream (occasionally). Once the baby comes, free time will be a thing of the past. On top of this, extreme stress can contribute to a number of developmental issues, making stress management an absolutely crucial part of maintaining a healthy pregnancy. There are few worse places to deliver a baby than on a plane or on a road trip across the country. If you need to fly somewhere during your pregnancy, experts suggest that the best time is around the 14 to 28 week mark. This is typically after all the morning sickness is gone. While flying, be sure to stay hydrated and get up and walk around regularly to decrease the likelihood of blood clots forming. Even the healthiest among us have nutritional gaps in their diet. This is even true of the healthiest expecting mothers. This is why doctors and pregnancy experts suggest that expecting mothers take prenatal vitamins. The best prenatal vitamins are loaded with folic acid, iron, calcium, iodine, B vitamins, and more! Prenatal vitamins can also be helpful when you are trying to conceive. In fact, the baby’s neural cord develops in the first month of pregnancy. This, therefore, means that it is important that right from the start, your body is getting all the essential vitamins and minerals you need. Looking for high-quality, all-natural liquid prenatal vitamins? Shop Natures Energy prenatal vitamins today!